Under a clear blue sky, you paddle your kayak on the calm waters of Burnet Bay as the towering spire of the San Jacinto Monument looms on the horizon. Later in the day, a vibrant sunset casts luminous orange light over one of the largest stay-cable bridges in the world. All the beauty and potential for adventure of the Texas Gulf Coast combines with a hearty helping of Lone Star State history in Baytown. Located just east of Houston and north of Galveston, Baytown offers all the charm of a small coastal town with plenty of family-friendly fun and ways to enjoy the outdoors. Look at a map of Baytown and you’ll see the city’s name is no accident. There are numerous bays and waterways in town that serve up a Texas-sized helping of adventure. Launch a kayak from the Eddie V. Gray Wetlands Education Center or the Baytown Nature Center, or cast a line from one of the fishing piers found in parks throughout town. It’s easy to do whatever kind of fishing you like in Baytown, as the town has both freshwater bayous and saltwater bays to wet a hook in. Since it’s within the Texas Gulf Coast, Baytown is a first-rate birding destination. In fact, the Baytown Nature Center is a location on the Great Texas Coastal Birding Trail’s San Jacinto Loop. More than 300 species of birds call the area home throughout the year. Explore seven miles of hiking trails, pay a visit to the butterfly garden, let your kids learn and play in the Children’s Discovery Area. There is even more to discover at the Eddie V. Gray Wetlands Education Center. Check out the 9,000-square-foot exhibit hall that showcases the diverse wildlife of the Gulf Coast. See juvenile alligators in Gator World, watch bustling honeybees in the Land of Milk and Honey, get an up-close look at some of the creatures that inhabit area’s waterways, and more. While Baytown’s breathtaking bays will keep you entertained, you’ll find its history will capture your attention. Just across the waterway from Baytown is where the Battle of San Jacinto occurred in 1836. The ferry that connects these two locales, the Lynchburg Ferry, helped thousands flee the oncoming Mexican Army before the battle. Experience what this journey was like by riding the Lynchburg Ferry and check out the San Jacinto Battleground State Historic Site while you’re there. Get a sense of Baytown’s past by cruising down Texas Avenue in the downtown area, which is full of fascinating historic buildings and storefronts built during the oil boom of the early 20th century. Stop by the Portrait of a Warrior Memorial Art Gallery to see portraits of fallen heroes, then order something delicious from one of the several great restaurants in the area. To get a sense of life when Baytown was a small rice farming community, visit the Republic of Texas Plaza to see homes and buildings from the late 1800’s and early 1900’s. Complement that with a tour of the Baytown Historical Museum, which tells the town’s story from its earliest inhabitants to the present day with artifacts from throughout its history. 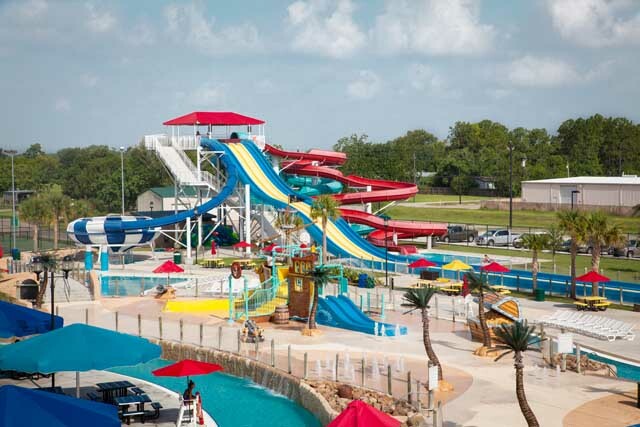 When the summer sun swelters, cool off at Pirates Bay Water Park. Relax in the lazy river or relish some heart-pounding action on the park’s array of thrill rides ranging from tube slides to the Flowrider, where you can show off your surfing skills. There’s even a play structure just for youngsters that includes water guns, spray nozzles, and special slides just for tots. For a different kind of thrill, experience the high-speed action at the Royal Purple Raceway. With a quarter-mile drag race track, an oval dirt track, seating for more than 27,000, legal street racing, and a NHRA Full Throttle Drag Racing Series event, the raceway offers year-round entertainment. If you’re an arts enthusiast, you’ll find plenty to adore as well. Visit the Art Center of Baytown to admire paintings, photographs, illustrations, and jewelry made by talented local artists. Then catch a first-rate production by the Baytown Little Theater, the Baytown Symphony Orchestra, or the Lee College Performing Arts Center. Not enough for you? Kick back in the adobe-walled tasting room at Yepez Vineyard and savor the flavors of a merlot or a sauvignon blanc made with Texas-grown grapes. Make sure you visit Baytown during one of its many annual special events as well, such as the Nurture Nature Festival in April, Grito Fest in October or Christmas on Texas Avenue in December. Whether you’re traveling for all the great fishing or to experience the allure of the Texas coast, you’ll find something to love about Baytown.